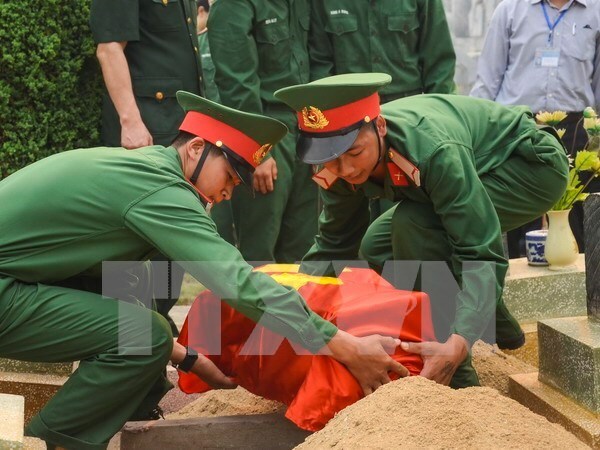 Ha Tinh (VNA) – The Military Zone 4 High Command and the People’s Committee of the central province of Ha Tinh held a burial service in Huong Son district on May 6 for the remains of 19 Vietnamese volunteer soldiers and experts who died in Laos during wartime. In his address at the event, Vice Chairman of the provincial People’s Committee Dang Quoc Vinh expressed his gratitude towards the martyrs who laid down their lives for the special solidarity and friendship between Vietnam and Laos. This is an opportunity for younger generations to commemorate the heroes’ incredible feat, he added. The provincial leaders and other participants offered incense and flowers to the fallen soldiers, showing their deep gratitude to them. During the 2015-2016 dry season, 19 sets of remains were collected by the search team of the provincial Military Command’s Special Task Board in Borikhamxay province and the capital Vientiane with the support from Lao authorities and local people. All of them are still unclaimed.